By Golly, Molly! : 40 Bites! A 9x12-foot picture of food almost got me into an accident yesterday. The chicken sandwich was HUGE. Make that TWO huge chicken sandwiches. With curly fries. Tomatoes so red. Right there. On the side of a city bus. For the WORLD to see. My head did a double-take like in old cartoons. Something Bugs Bunny would do. Or more fittingly, Porky Pig. Boing-oi-oi-oi-oing. Good thing a couch-sized fudge brownie wasn't in the pic; I would've crashed for sure. The whole thing was unacceptable. I turn 40 this week. High time my foody-senses start scaling back. That's what they're telling me, anyway. Seems the right thing to do. Or maybe...(I love "or maybes! ")...I'll be fine if I just stick to my youngest sister's rule for her kids: "Five more bites if you're five years old. Three more if you're three." Because right now I'm thinking forty more bites is a pretty good deal. And totally fair and square. After all, I am 40. 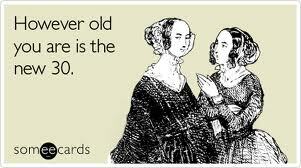 Hmmm, this getting older business may not be half bad. Turning 40 might also mean it's high time I learn to play big people games like Solitaire. * Or read intellectual courtroom thrillers. Or better understand the stock market. It's high time I start settling into who I am. Oh don't be fooled, I'm more than a city-bus-gawking foody who, on occasion, thinks about cake more than Jesus. I am - and you are - a sought-after, thought-about, pursued, understood, and loved child of God. So let's celebrate and eat cake! It's someone's birthday somewhere! *From childhood to this day, Solitaire remains a mystery I think I'm still too young to figure out.